In recovery, our addictions can be viewed as masks. We use our addictive substance or person to mask our feelings - even from ourselves. 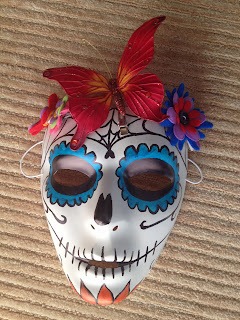 In this creative activity, I asked everyone to draw on a mask. With Day of the Dead approaching, they were invited to illustrate the outside of the mask Dia de los Muertos style - or simply as how they believe they portray themselves to the world. Then, on the inside of the mask, they were asked to draw or write what they don't want others to see - whether feelings or character defects. It was a powerful assignment, for me, too. The above mask actually used blank white masks from here, but the consensus of our group was that the matte texture of the masks listed above and the shape were both preferable to these shiny texture, full-face masks. 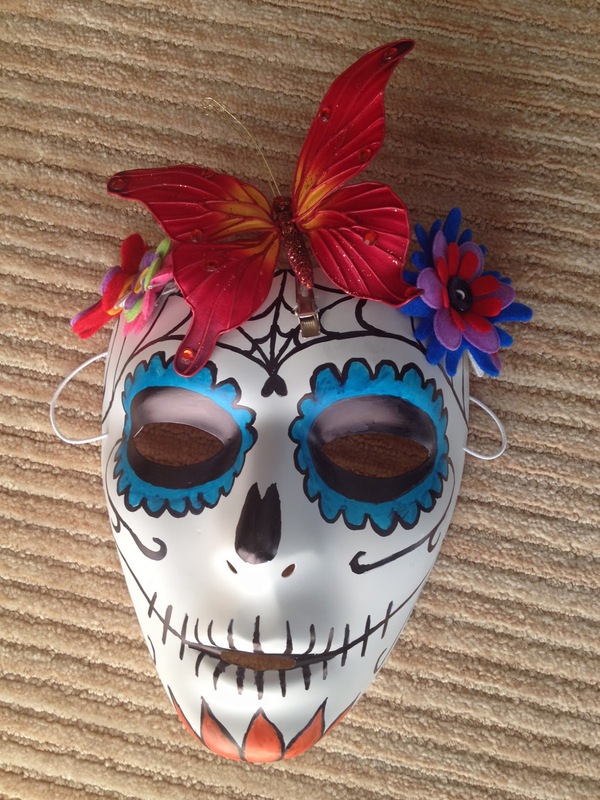 Here is a mask made with the blank masks listed under supplies. 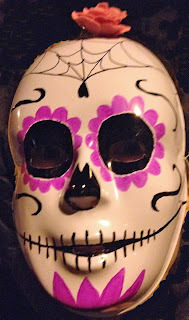 Whether you celebrate the Day of the Dead or not, I hope you have a meaningful experience playing with masks. I really do appreciate this site. it means a lot to me that you take the time to express and share your creative energies with the world. People like me do very much NEED resources like this and sharing them, reinforcing the expressive arts, and helping those who need to find ways to voice themselves through the nonverbal arts is a powerful and much needed outlet. Again thanks so so much!!! I came across your blog looking for 10th step inventory sheets, and now I feel like I found a buried treasure 😁 Gonna share with some friends that I know would love this resource.